Newcastle made it three wins from three against Brisbane this season. Mike Mulvey made two changes from last week’s 1-1 draw with Western Sydney, bringing Diogo Ferriera and Steven Lustica into the side, with James Donachie and Liam Miller making way. This meant Thomas Broich returned to his usual left-wing berth, and Ivan Franjic dropping back to the right of defence. 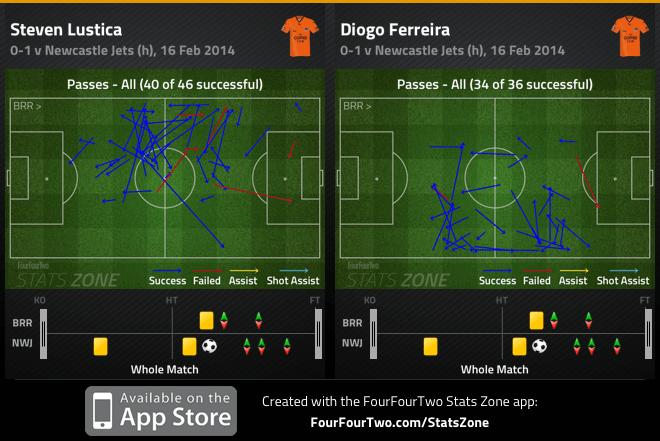 Ferriera was in central midfield. Clayton Zane reshuffled his side significantly from last week’s 3-2 loss to Wellington, moving to a 4-2-3-1 formation that looked 4-4-2 for long periods without the ball. Adam Taggart was in behind Emile Heskey, supported by Craig Goodwin and James Virgili from the flanks. Josh Mitchell started ahead of Taylor Regan at the back. Taggart scored from the penalty spot in an exaggerated version of possession v counter attack. Newcastle have caused Brisbane problems in the past by packing the midfield zone and pouncing quickly on the break, and broadly speaking, that was their approach here. However, whereas Gary Van Egmond often switched to 4-3-3, here Zane took what was, on paper, the ‘brave’ option of using two strikers – although with both Heskey and Taggart dropping behind the ball to keep the side compact, it’s difficult to say that it was a particularly attacking selection because of the way the strikers looked to block passes into Brisbane’s midfield. Newcastle were happy to allow Luke Brattan to wander into deep positions between the two centre-backs to collect short passes, and although this isn’t as prominent a pattern of play under Mulvey as it was under Ange Postecoglou, perhaps Brisbane wanted to ensure they had an extra man at the back against Newcastle’s front two to retain possession. As it were, this ‘back three’ dominated the passing statistics, finishing as the top three for the match and together accounting for about 40% of Brisbane’s total passes. Brisbane finished with 72% possession, illustrating their dominance of the ball – but this is hardly surprising. However, when the ball was played forward into midfield, Newcastle pressed aggressively, with Ruben Zadkovich and Zenon Caravella pushing high up onto Ferriera and Lustica to prevent them from having time on the ball and being able to face the play. Both struggled to influence the match and were eventually substituted, with Brisbane lacking their usual control in central areas. As their passing chalkboards show, their distribution was towards the flanks – not a bad thing in itself, but indicative of how they were being pressed away from the final third. The key player, then, was Broich. Last week against Western Sydney he was underwhelming, because his central deployment meant Brisbane lost a man in midfield – normally, he drifts inside from a 4-3-3, to become an extra passing option. That was the case here, too, especially obvious when Caravella and Zadkovich pushed high up onto Ferriera and Lustica (remembering that Brattan was deeper than usual between the two centre-backs). There was often space between the lines for Broich to wander into, and predictably, Brisbane’s best moments came when the German took advantage of that space, most notably for the fine passing move that finished with Berisha flashing a volley just wide from a Franjic cross. 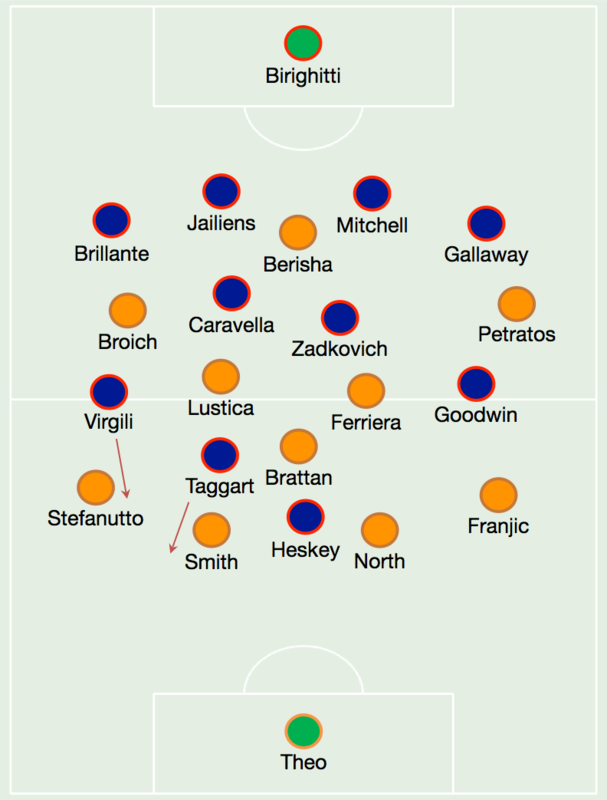 Broich takes up a position between the lines of Newcastle’s midfield and defence, links the move into an advanced position and plays in the free man out wide – Brisbane needed to create more of these situations. Berisha, too, seemed aware of where the space was, and although it’s typical of his usual movement, seemed keen to drop off into deep positions. However, he struggled to receive passes cleanly, often because one of Newcastle’s centre-backs would follow him out of defence to prevent him from getting the ball – Mitchell was booked for one such incident, as was Kew Jailiens later for a similar challenge on Broich. It was interesting that despite that latter booking, overall the Newcastle centre-backs weren’t as proactive when it came to Broich, perhaps because it was more difficult to track the playmaker’s movement inside from a wide position – whereas Berisha was starting from a position alongside them, and would therefore be more ‘obvious’. Newcastle’s game-plan, meanwhile, was far more direct than Brisbane’s methodical build-up, and often the away side simply bypassed the midfield zone altogether with long balls to Heskey, who was able to hold up play with his strong physique. The key player, though, was Taggart, who constantly ran off the shoulder of Brisbane’s centre-backs and darted onto balls played in behind. His pace was essential in breaking beyond the high line, and he had a number of fine chances to open the scoring in the first half, when Newcastle had a period between 25-35 minutes where Brisbane were simply unable to contain their counter-attacks. There was the shot on the half hour mark that Michael Theo spilled, as well as a few moments earlier when Heskey had played him in but had been let down by a first touch that took him away from goal. The other player leading these rapid transitions was right-winger Virgili, who dribbled forward purposefully and came close with a low drive across the face of goal – much to the consternation of Taggart, who felt his teammate should have squared it. The positioning of Newcastle’s pressing was an important factor here – because they were trying to close down quickly in midfield, it meant when they successfully created turnovers they could break quickly against Brattan, Smith and North, with the Brisbane full-backs essentially out of the picture because of the way they move high and wide to create space. Still, the fact Newcastle were consistently creating these type of chances was encouraging. It’s worth remembering that this effectively the trade-off Brisbane make for their possession-based game. The high line is necessary to press high up the pitch and retain possession for long periods, so it’s difficult to suggest the Roar should have sat a little deeper – if they did, they wouldn’t be as effective going forward. The second half followed the same pattern as the first – Brisbane controlling the ball but struggling to work it forward, and Newcastle counter-attacking. Again, the most promising moments was when Broich found room between the lines unmarked, and he was involved in the build-up for Dimitri Petratos’s fluffed snap-shot – the youngster should have done better having been played in by Berisha’s clever lay-off. The breakthrough came from an atypical source, Josh Brillante, who made a rare foray forward to catch Shane Stefanutto unawares. The fact it came down the right was interesting, though, as this was the flank from which Newcastle had looked most dangerous, with Virgili squandering a fine chance later on the hour mark. Mulvey’s reaction to going behind was bold, bringing on two out-and-out attackers in Jean Carlos Solorzano and Henrique in place of Lustica and Ferriera. It wasn’t exactly clear how the side was now meant to be set up, and it appeared more a change for the sake of throwing on extra forwards. His thinking might have been to bypass the zone in which Newcastle had been pressing, and to ask the ‘back three’ to move forward more and play the penetrative balls forward. Whatever the intent, it was certainly bold, and left Brisbane even more exposed to counter-attacks – a risk they probably had to take. It seemed that Solorzano was supposed to go wide (starting on the right, but switching to the left when Matt McKay came on later), with Henrique and Petratos in the advanced midfield positions – a position both players have filled in the past, but hardly the most secure options available. Broich appeared to have a wandering brief, which felt important – Mulvey would’ve been aware of how shackled he’d been permanently central last week. Henrique was responsible for covering him in both directions, darting forward to create left-sided width and tracking back to cover the left-of-centre midfield position. Zane, by contrast, was understandably negative with his use of the bench. Jacob Pepper replaced the weakest player in attack, Goodwin, giving Newcastle fresh legs and better defensive protection down the flank, while Joey Gibbs replicated Heskey’s hold-up role upfront. Mitch Oxborrow was a late, insignificant change to wrap up the game. Newcastle benefitted from Brisbane’s surprisingly poor response to going behind, as they attempted shots and passes from difficult angles, and were too keen to play the killer ball. Their strengths remain in breaking down opponents patiently, and perhaps struggled with ‘too many’ attackers being ahead of the ball – Newcastle’s line was too deep to seriously consider attempting to play people in behind, and they needed to work the ball from side to side to stretch the defence instead. Newcastle is certainly Brisbane’s bogey side, even though this was a slightly different manner of victory for the away side. However, their physical midfield seems to be a real problem for Brisbane, who normally deal with that kind of approach with patient, probing passing, but lacked that quality here. Mulvey won’t be too concerned, however. They remain seven points clear at the top, and they’re always going to be vulnerable to pace in behind with their possession-based system (as they were here with Taggart) – it’s a matter of disguising that weakness with their strength, which is calm, slick passing from midfield, which is why Newcastle were so keen to close down aggressively in that zone.